Standort: 3: Plasma Acceleration . The Plasma Acceleration Group is dedicated to advance and apply plasma-based particle accelerators and further the understanding of the underlying physics. 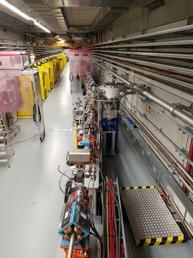 In the field of plasma acceleration, high-intensity laser pulses or particle beams are utilized for the excitation of extreme charge-density modulations in plasmas. These modulations may set up field gradients of more than 100 GV/m and propagate as waves through the plasma medium with velocities close to the speed of light. Thus, they are suited perfectly for the acceleration of a copropagating, charged particle beam. Nowadays, ultra-short packets of only few-micrometer length consisting of up to 10^9 electrons are routinely driven to energies of more than a GeV using this process over distances on a centimeter scale. Owing to the fact that plasmas allow for a thousandfold increase in electric field strength compared to modern accelerating structures of conventional design, they raise hopes for a revolution and miniaturization of todays particle-accelerator technology. In addition, plasma-generated, ultra-relativistic electron beams are intrinsically short and therefore constitute potentially attractive drivers for radiation sources of highest brilliance (e.g. in free-electron lasers).